We see it all the time — pro footballers painted as overpaid, overdramatic villains. While we won’t comment on media sensationalization, we instead take a closer look at some of the good deeds done by the sport’s most infamous figures. 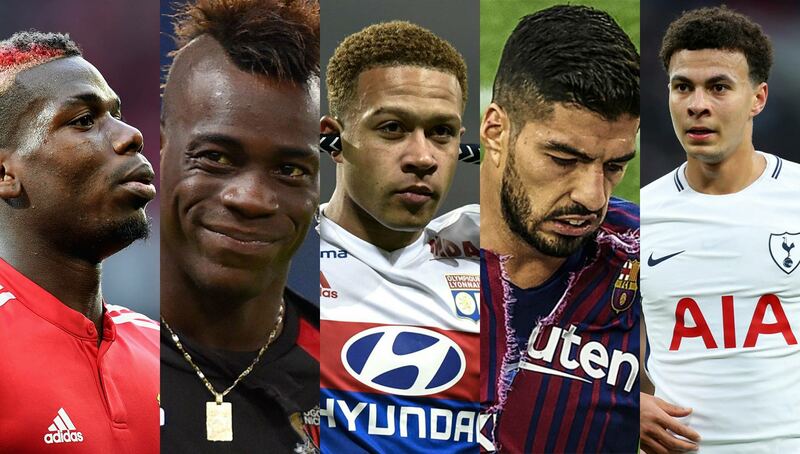 The world’s biggest professional footballers earn an eye-watering amount of money, and yet what they do with it all seems to be a mystery if it isn’t all blown on lavish cars and houses. While there’s nothing wrong with a little luxury, with the salary these players earn and their high visibility, one could argue there is also a responsibility or obligation for them to do good and help others. 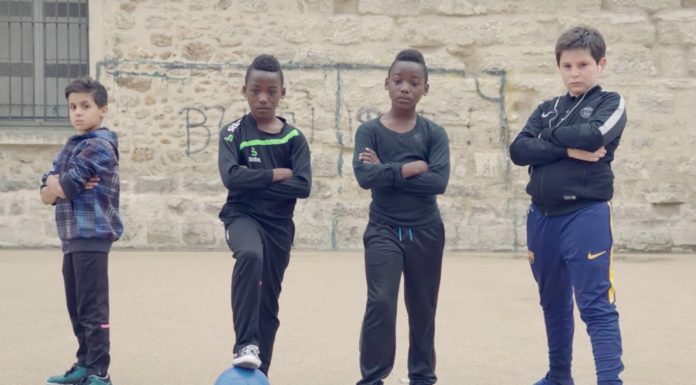 However, the public in general is drawn to the Instagram flexing and diamond chain-wearing side of pro footballers, so much so that any good deeds or charitable actions oftentimes go overlooked. Not only this, but questionable behavior both on and off the pitch is put under a magnifying glass by tabloids, which always seem to love stirring the pot and making stories wherever possible. As a result, many footballers are painted to be nothing but trouble for one reason or another. But let it be known that many, while they may attempt to keep large aspects of their lives private, also manage to do some good — whether that be small gestures or full-blown involvement. This in theory would help to qualm a lot of the negative image which people are so fixated on, however these acts aren’t as widely covered as some of the more scandalous ones. We’ve explored a few of the sport’s difficult personalities who have indeed shown that they truly do have a heart. A real enigma for football fans. The Barcelona striker is undoubtedly gifted with an abundance of talent, particularly known for being a nightmare for defenders to mark and his clinical finishing. There is a dark side to the Uruguayan though, making him one of football’s more controversial figures. Often branded the epitome of a “cheat,” Luis Suarez has shown that he’ll go to great lengths to win a game. 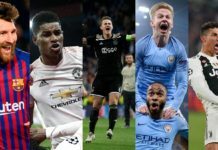 Not only has there been the diving and theatrics, but there are also the incidents in which he was found guilty of using a racial slur towards Manchester United’s Patrice Evra and his infamous biting of opponents. A shocking three instances of the latter is nothing short of disgraceful. While he doesn’t help himself with those on-pitch antics that have kept him in the eye of the media storm, his humanitarian side has gone quietly under the radar. In 2015, Suarez sent out 500 Christmas gift baskets to patients and families of a Uruguayan hospital in his hometown of Montevideo. It turns out that the food and drinks he sent were part of an ambassadorial role at the Pérez Scremini Foundation, a children’s cancer charity. 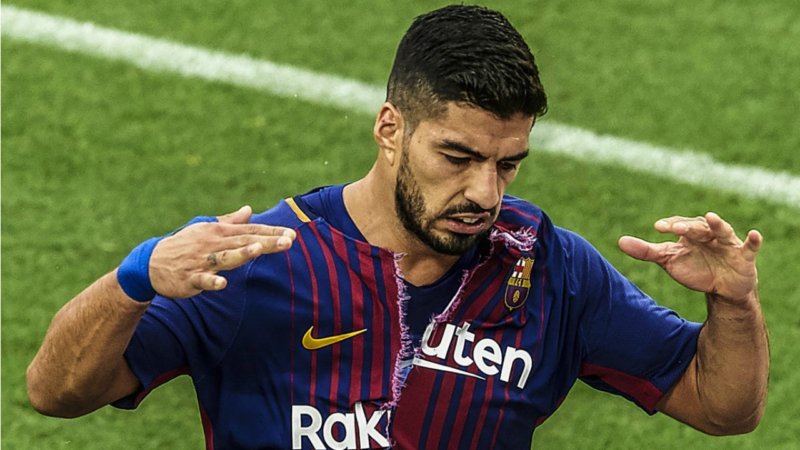 In addition to this, in April 2016 after meeting a young fan with phenylketonuria — a rare blood defect — Suarez was brought to tears and dedicated his next goal to the youngster. More importantly, he then went on to launch a charity auction for PKU research. While he’s (maybe rightfully so) been painted a villain on the pitch, he’s clearly capable of some selfless acts to help the lives of others off of it. The Spurs player, for all his praises of cultured passing and tenacity, has also began to earn himself a bit of a negative reputation. 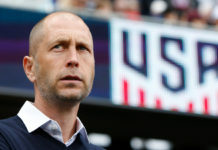 Several questionable instances of diving as well as a “nasty streak” to his game with some wincing challenges and discrete antics raise an eyebrow to his overall discipline. 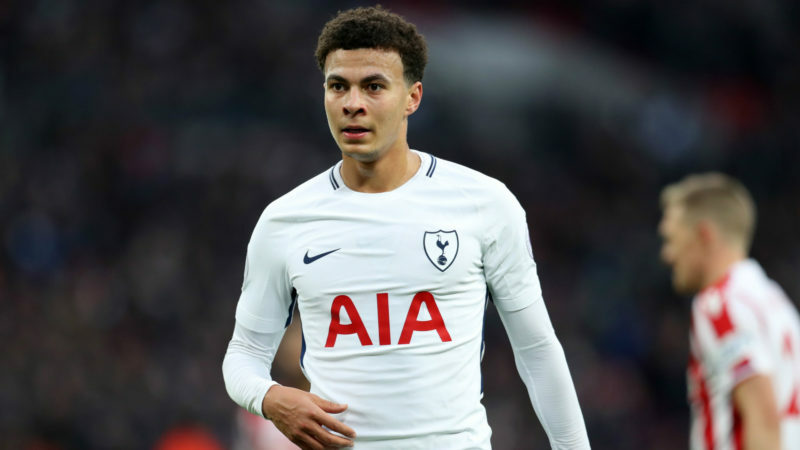 Tottenham manager Mauricio Pochettino has defended this in the past though, calling it “an essential part of Dele’s game.” Especially being a young and English player, he is perhaps more likely to be scrutinized by fans and the media for his behavior just as much as his performances. Away from all the countless hours he spends playing Fortnite, Alli has been able to show his more compassionate side away from the playing field. 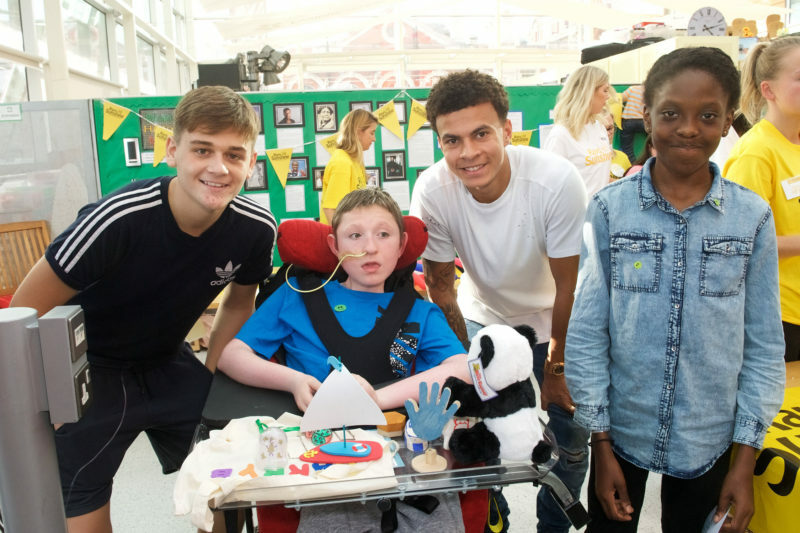 As part of National Play in Hospitals Week, the midfielder made a surprise appearance to the kids and families at Evelina London Children’s Hospital for the Rays Of Sunshine children’s charity. He helped children build bears, decorate biscuits and color in decorations to jazz up the children’s bedsides, bringing some much-needed fun and distraction from their own struggles. A player who really is expected great things of, we’ve probably yet to see the best of Paul Pogba since his big money return to Manchester United. All pundits will agree that the France international shows flashes of being the best center midfielder in the world, yet time and time again there seems to be an issue with getting the best out of him. His recent disharmonic relationship with former manager Jose Mourinho was well documented and argued to be a core aspect of Man U’s terrible form earlier this season. But it wasn’t the first time that light was shed on Pogba’s “difficult” personality and how to handle his supposed ego. After all, this guy is the epitome of flash. The boots, the haircuts, it’s all very flamboyant, and the constant dancing on social media would lead many to ask, just how much does this guy actually care about what’s best? But with a ludicrous amount of earnings, the World Cup winner has shown his more heartfelt side with his funds too. At the end of last season, for the Players Awards event at MUFC, Pogba donated what could only be disclosed as “a huge amount” towards the selected charity for the evening, and helped make a young fan’s dream come true in the process. Samuel, a young United fan with cerebral palsy, whose video of meeting some of the first team squad went viral earlier that year, was given a lifetime opportunity to lead the players onto the pitch and serve as a mascot. This was made achievable thanks to the incredible gesture from Pogba and the money raised through the auction. 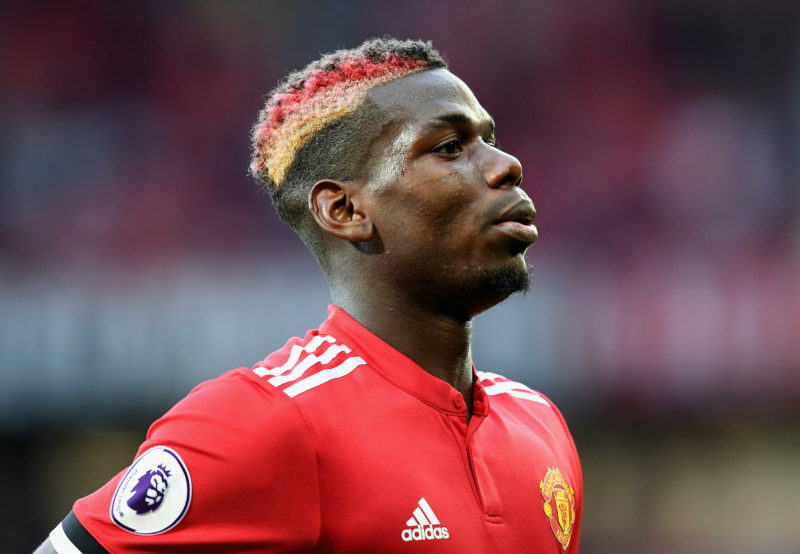 It’s also reported than when Pogba completed his £89 million move back to Manchester United from Juventus, he flew over to Turin on his day off to not only to clear out his locker and say his goodbyes to teammates, but also to surprise each and every one of the Juve staff with a brand new Rolex watch. How’s that for generosity? 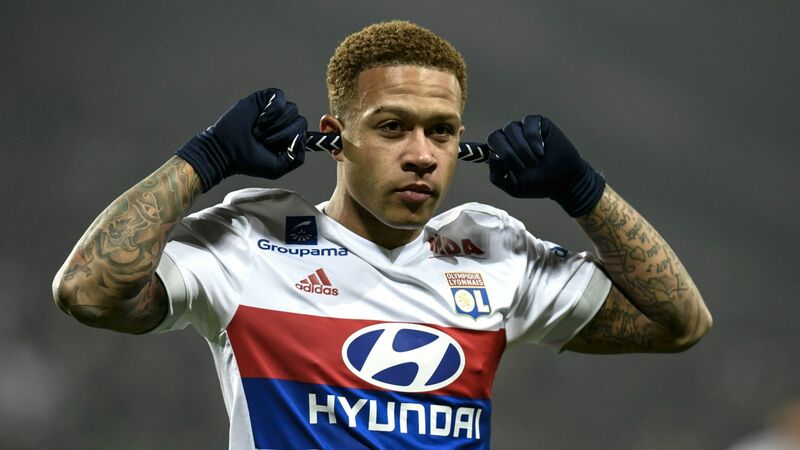 The Dutchman Memphis Depay has found his best form again since his move to France where he currently plays his football with Lyon. But even in his own country, the forward is a divisive figure in the media for his discipline and bad boy attitude. We got a glimpse of it in the Premier League during his brief and unsuccessful spell at Man United. His fellow countryman and manager at the time Louis Van Gaal eventually had seemingly lost all patience with him, despite the occasional shows of brilliance. It’s no secret that Memphis also has a vested interest in rap — he’s even released music of his own. Some literally about the stereotypical gold chains and lavish stuff, furthering his bad boy image one could argue. But with the release of the single “AKWAABA” which delves into his Ghanaian roots, he has also set up The Memphis Foundation, where he’s promised to use proceeds to support the Ghana Blind Sports Association and the Ghana Deaf Sports Federation in order to develop the sports programs in the various senior high schools. Memphis doubled up his trip to Ghana not only to create the track and music video, but also to pay a visit to participating schools and present them with sports equipment. A conference was held to establish the future and sustainability of the project which he called The Genesis, stating he will return to Ghana in the near future to see its development. From the brilliant, to the awful, to the downright bizarre, Mario Balotelli is a purely eccentric character. Probably better known for his off-pitch exploits rather than his tremendous football ability, in particular during his time at Manchester City, he seems to be drawn to the spotlight like a bee to bright flowers. From training ground bust-ups (including throwing darts at the youth team) to almost burning his house down setting off fireworks from a bathroom, keeping the striker out of the papers was probably the hardest thing for the blue half of Manchester to deal with — the winning silverware part came a lot easier. 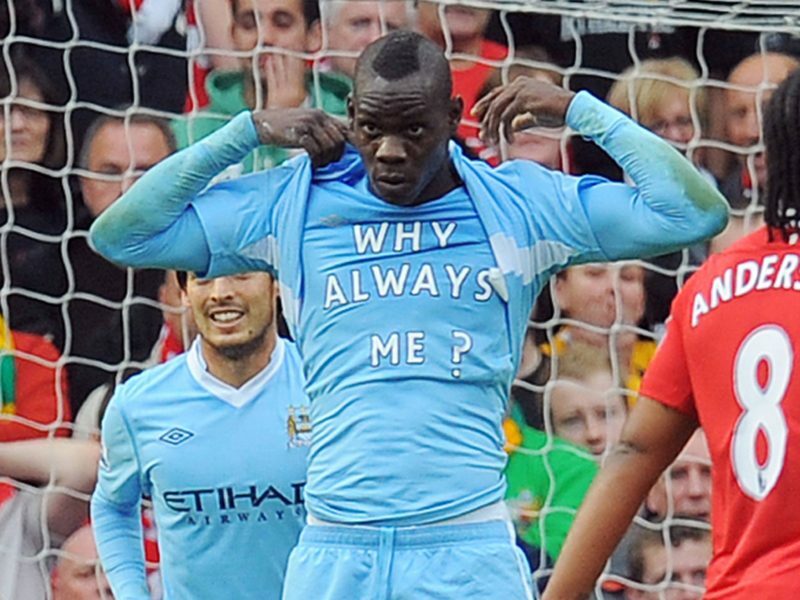 One of Balotelli’s most iconic moments in his career; this goal celebration revealing the message on the shirt after scoring in the Manchester Derby. Though he has mellowed out a bit with Marseille after impressing at Nice, he is still no doubt a controversial figure for his track record and much like marmite, you either love him or hate him. But one thing you can’t dispute is his willingness to help out the less fortunate. One of the best stories out of the rumor mill was how he paid for 24 homeless people to be put up in the ultra-swanky Hilton Hotel in Manchester for New Year’s Eve. This wouldn’t have been the first time he helped out the homeless, as he spontaneously gave $1,000 in cash to a homeless man outside a Manchester casino after Mario had a big 5-figure win that night. 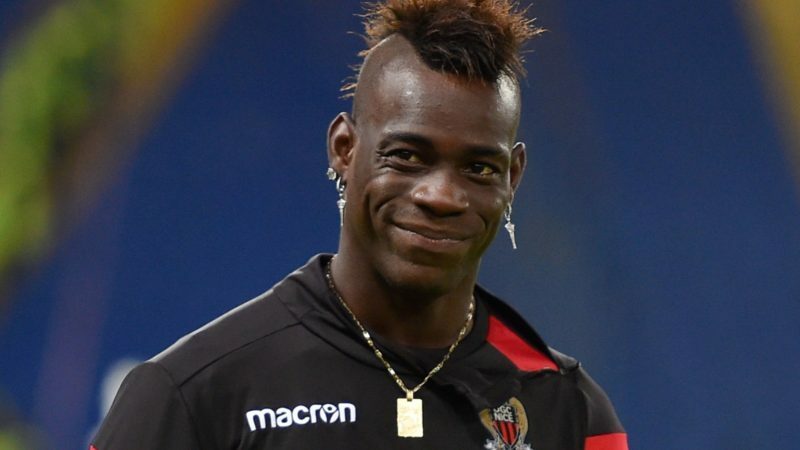 Take money out of the equation and he has demonstrated his compassionate side too, albeit with that trademark Balotelli eccentricity. One day after practice a young fan asked for his autograph which he was happy to give. He asked why the boy wasn’t in school, to which he responded he was being picked on. So what did Balotelli do? He drove the boy and his mother to the school to confront the bully and speak to the headmaster to resolve the problem. Not all heroes wear capes remember. It’s not just humans he has a soft spot for either — Mario is a big dog lover and volunteered walking all of the dogs at the Manchester Dogs Home while his own was under quarantine back in Italy. 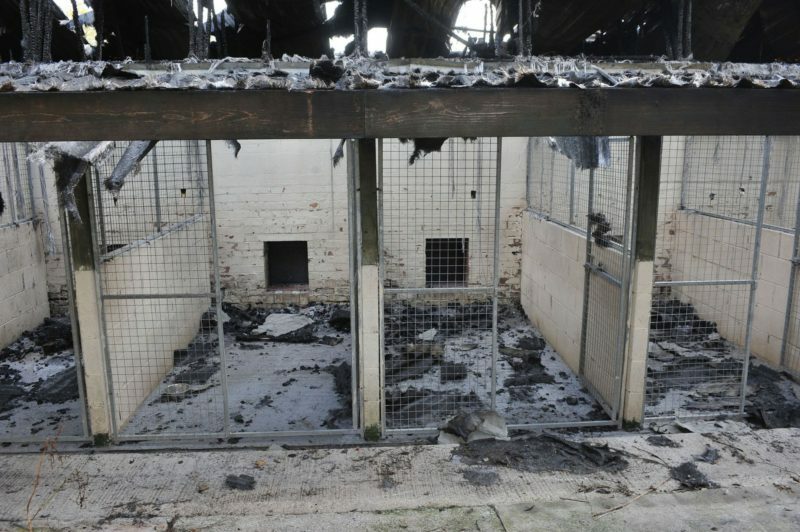 The Manchester Dogs Home after the damage from the tragic fire. Sadly in 2014, the home was hit by a large fire and as many as 60 dogs were killed in the blaze amongst the excessive and costly levels of damage to the premises. One last twist in the tale though was a mysterious £10,000 anonymous donation made towards the damages. All of the staff to this day are convinced that Super Mario was behind that too! A true humanitarian.